On this day in 1942, the Nazis issued an ultimatum to the Judenrat of the Minsk Ghetto in Belarus: turn over Hersh Smolar for torture and execution by noon, or they would all face execution themselves. Smolar, a dedicated Communist who was a writer and editor in civilian life, had been a problem for the Germans for quite some time. He was a leader in the resistance of the Minsk Ghetto, and that resistance was a force to be reckoned with. 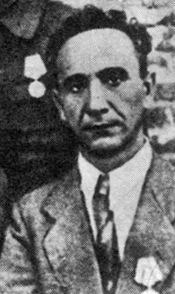 Smolar and others like him formed an underground organization that printed leaflets about Soviet successes in the war, occasionally hid non-Jewish Communists and escaped Russian prisoners of war within the ghetto (the infectious disease ward of the hospital was a great hiding place: the Germans never went there), and above all tried to save the lives of as many Jews as possible. The Minsk Ghetto underground formed links with underground resistance organizations on the outside and they worked together. Unlike the rest of Eastern Europe, the general population of Belarus was as a whole sympathetic and helpful to the Jews. The result was that Jews were able to escape the ghetto and join partisan groups in the forest by the thousands, surviving and taking out Nazis at the same time. The Minsk Ghetto leaked like a sieve. By the time it was liquidated, 10,000 of its residents had joined partisan groups in the forest. Smolar, of course, had tried to keep his activities a secret from the Nazis, but he couldn’t avoid their attention forever. Unfortunately the Minsk Ghetto Underground wasn’t very good at keeping itself a secret and twice it was decimated by mass arrests. By the spring of 1942, Smolar was a hunted man, and in hiding. On April 1 he was in the hospital’s infectious disease ward, disguised as a typhus patient, meaning his face could be covered. (Typhus patients suffer extreme sensitivity to light.) The Judenrat paid him a visit and told him about the Nazis’ ultimatum. Some of the Judenrat members were prepared to turn Smolar in, so only one person would have to die. Of course, the ideal solution would be where no one would die. They turned to the Tanakh for guidance, specifically the story of Joseph. When Joseph’s brothers sold him into slavery in Egypt and told their father he had died, they dipped his coat in the blood of a kid and presented this as proof of his death. Displaying the sincerest and brassiest form of flattery, one of the Judenrat members took a blank passport, filled it out with Smolar’s photograph and details, smeared it with blood from a recent Nazi victim, and took it to the Gestapo officers. He explained that they had apparently gotten Smolar in a random shooting, as the passport had just been found on a mutilated body at the cemetery. And the Germans actually fell for this. April Fools! Barbara Epstein’s excellent book The Minsk Ghetto 1941-1943: Jewish Resistance and Soviet Internationalism records the rest of the story: Smolar remained in hiding in the hospital for another four months. Eventually he left the infectious disease ward and moved to a specially constructed hiding place in the attic chimney, which was only large enough to stand in. Presumably he was very happy in August 1942, when the time came for him to leave the ghetto and join a partisan group in the forest. He survived the war … as did about 4,500 other Jewish partisans from the Minsk Ghetto. Smolar wrote a memoir about his experiences and the Minsk Ghetto Underground in general, titled The Minsk Ghetto: Soviet-Jewish Partisans Against the Nazis. He died in Israel in 1993, age 88.